Sulzbach-Rosenber. 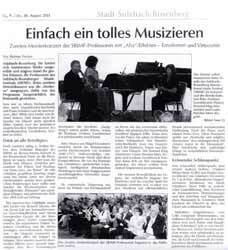 The professors of the Sulzbach-Rosenberg International Music Festival selected many interesting works to show off their formidable abilities. At the second masters' concert, there were fewer modern works and the program was devoted instead to the Romantic period. Liszt was on the menu, Rachmaninoff, but also Mendelssohn-Bartholdy and Franz Schubert and, as an unexpected epiphany, three songs by Richard Strauss. And, so as not to miss the epoch of Mozart entirely, two pianistically demanding sonatas by the Neapolitan harpsichordist Scarlatti. 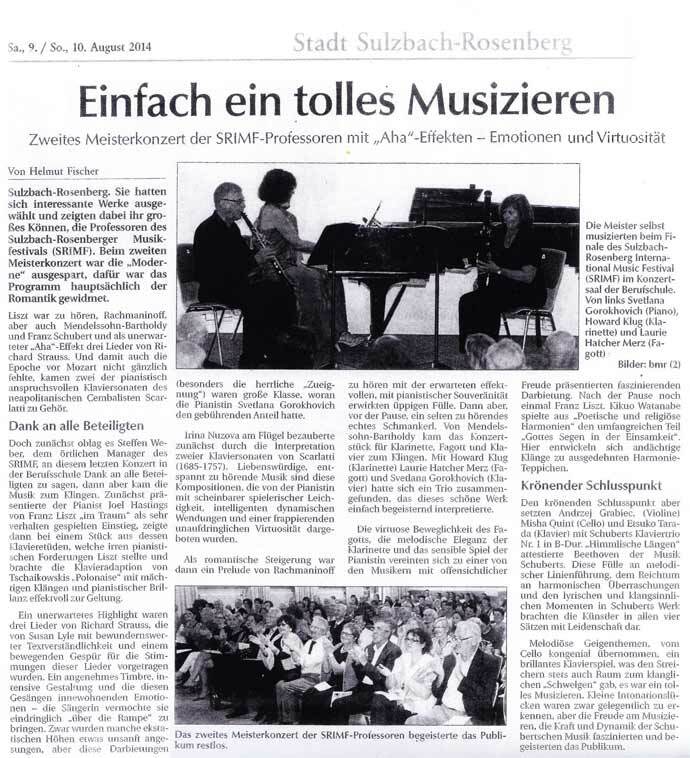 But first of all, Steffen Weber, the local manager of the SRIMF, took this opportunity, the final concert at the Professional School of Music, to thank all the participants – then the music started. Pianist Joel Hastings began with a restrained presentation of "En Rêve" by Franz Liszt, only to show with one of his études what wild pianistic demands Liszt list can place on a performer. He finished with the transcription of Tchaikovsky's "Polonaise," brought off with powerful tone and pianistic brilliance. Three songs by Richard Strauss, performed by Susan Lyle with admirably clarity and a moving feel for their changeable moods, were a unexpected highlight. A pleasing timbre, intense phrasing and that deep emotion these songs contain – Lyle brought these across with urgency. These performances (particularly the wonderful "Zueignung") were of the highest caliber, for which pianist Svetlana Gorokhovich is also due credit. Irina Nuzova enchanted with her interpretation of two Piano Sonatas by Scarlatti (1685-1757). These compositions are charming, relaxing music, which Nuzova offered up with seemingly playful ease, intelligent dynamic turns and an astonishingly subtle virtuosity. A prelude by Rachmaninoff provided a romantic intensification, with the anticipated sensational, lush fullness only pianistic mastery can afford. Then, before the intermission, came a seldom heard treat: Mendelssohn-Bartholdy's Concert Piece for Clarinet, Bassoon and Piano. With Howard Klug (clarinet), Laurie Hatcher Merz (bassoon) and Svetlana Gorokhovich (piano), a trio had come together that gave this beautiful piece an inspiring interpretation. The virtuosic sprightliness of the bassoon, the melodic elegance of the clarinet and the sensitive playing of the pianist combined in a performance which the musicians presented with obvious pleasure. Liszt returned after the intermission. Kikuo Watanabe played the extensive "Bénédiction de Dieu dans la solitude" from his Harmonies poétiques et religieuses, in which pious tones developed into an expansive web of harmonies.